When logged into your Jackrabbit database, click the ? button on any page to access your options for contacting the Support Team. Support tickets allow the Support Team to log into your database, research, or re-route your issue to a specialist. Correspondence is through email. 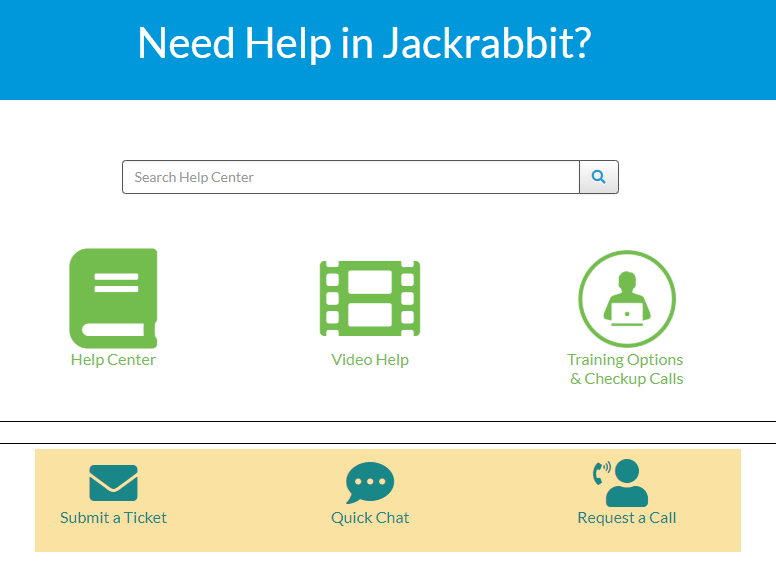 Jackrabbit Support is open Monday through Friday 8am to 8pm Eastern. Quick Chat is for SIMPLE questions, on basic topics, where no research is required. Quick Chat is open Monday through Friday 10am to 6pm Eastern. Request a Call is for SIMPLE questions, on basic topics, where no research is required. Request a Call is open Monday through Friday 10am to 6pm Eastern.